We are very grateful to Peter James of Wildings for allowing us to see the deeds of this interesting property located at the heart of Thornbury near the old Market Place. On this page we are providing a history of the main building which was originally two separate properties. These can be seen on the left hand edge of the photo on the left above. Note that at the time the photo was taken the two buildings were clearly different sizes. Thomas Osborne Wetmore acquired these buildings and other adjoining properties after he had built Park House, the large house with extensive gardens built off the High Street at the rear of number 14. We have no site plans showing the original extent of gardens in each of the two houses, but it appears likely that Thomas would have used some of the garden into the land required for Park House and its gardens. To provide access to and from Park House from the High Street, Thomas created two entrances, one between 14 and 16 High Street and the other between The Lion and the old Toll House. The two buildings were surrounded by this roadway. Following Thomas’s death in 1868, his property was put up for sale. Lots 7 and 8 referred to the sale of two adjoining shops and dwelling houses, one with a garden occupied by Mrs Brown at yearly rent of £14 and the other without garden occupied by Mr Smith at yearly rent of £8. The property appears to have been bought by Harris Collings. We have been unable to trace any old deeds of this property so have had to rely on census records, rate books and electoral records etc to build up a brief history of the property. Our earliest record is the 1840 Tithe Survey in which the property was listed as Plot 58, a house and court owned by Mrs Leach and occupied by James Clutterbuck (see below). Benjamin Leach – Benjamin was born on 4th March 1773 and baptised on 28th April 1773. He was the first son and fourth child of Benjamin Leach snr and his wife Catherine (nee Tanner). Benjamin became a tailor like his father. On 12th January 1804 Benjamin married Mary Latch, the daughter of Joseph Latch and his wife Mary. According to later deeds of the property Benjamin purchased the property from Joseph Ford and others. We don’t know sufficient information to identify Joseph but he may be the Joseph Ford, carpenter who owned 11 and 13 Pullins Green and 1 Crispin Lane. The description shows that even this house in the High Street was ‘one messuage, formerly two houses‘. The land tax records show Benjamin as owner and occupant of the property in 1809 to 1824. We do have some ideas about the earlier owners from the land tax records, but we are reluctant to mention these at this stage. Note – the date of ‘1821’ inscribed into a beam displayed in the shop. This can seen by entering the left hand door of the shop, walking towards the back, but turn around when half way. The part of beam showing the date has been intentionally left uncovered for public display. This would have been at the rear of the premises, facing the back garden, as it was back in 1821. The extension of the property to cover the garden took place a lot later. We don’t understand the significance of the date. Benjamin and Mary didn’t appear to have had any children, but according to the inscription on their gravestone in St Mary’s Church they adopted Mary Ann Vaughan, the daughter of Mary’s sister, Hester and her husband John Vaughan. Benjamin died aged 51 and was buried on 25th July 1824. In his last will and testament dated 11th December 1822 Benjamin left the house to his wife, Mary, for her natural life and then it was left to his niece, Mary Ann Latch Vaughan (the eldest daughter of John Vaughan and Hester (nee Latch) with strict restrictions that she should not attempt to sell or mortgage the property (in which case the property was to be given to George Hurman (eldest son of Benjamin’s sister, Catherine) with the same restrictions). In the event of George trying to sell or mortgage the property it would be left to George Cousins, the eldest son of Benjamin’s sister, Elizabeth. Mary carried on living in the property. The 1825 and 1826 land tax records show the property owned by John Vaughan, (presumably because his daughter Mary Ann was still a minor) and it was occupied by Mary Latch. Following John Vaughan’s death in 1826 to 1832 (the last land tax record we have seen) the records show Hester Latch as being the owner and Mary Leach as the occupant. The 1841 census shows Mary had moved to Banbury with her ‘adopted daughter’ Mary Ann now married to James Skinner, a carrier. At some time after the 1840 Tithe Survey the property was sold to Thomas Osborne Wetmore. Mary carried on living in Banbury until she reached the age of 99 and she died there on 2nd April 1868. Their gravestone in Thornbury St Marys Church shows that their adopted daughter, Mary Ann Latch, the relict of James Skinner, died on 1st November 1891 at Bridge House, Banbury. James Clutterbuck – James was living in the property as the tenant of Mrs Leach at the time of the 1840 Tithe Survey. James was born in Thornbury on 9th March 1800 and baptised there on 24th May 1800. He was the son of George Clutterbuck and his wife, Elizabeth Davies. We are not sure when James married Phillis Wyatt. Presumably it was was in London which is where she was born and where their first five children were born. Of these we haven’t traced the baptisms of Maria born about 1824, Elizabeth born about 1829, Adelaide born about 1832 and Jabez born about 1837. Their daughters, Phyllis and Mary were both baptised in St Andrews Church, Holborn, Phillis on 18th September 1833 and Mary on 3rd April 1835. The family must have moved to Thornbury about 1838 as Katherine was born here about 1839 and Enoch in 1840. Both of them were baptised in Olveston on 22nd July 1847. George was born on 2nd March 1847 and baptised at Olveston on 30th May 1847 and Reuben was born on 16th April 1848 and baptised at Olveston on 8th July 1849 and he died in 1850. We assume that because they baptised their children at Olveston James and Phillis were probably Quakers. We are not sure where James was living at the time of the 1841 as he was living in the High Street, but tagged on the end of the route, not in the sequence of where he was living. At the time of the 1851 census he was living at 4 High Street. In this census James was a hairdresser aged 40 living with Phillis aged 37 and children Maria aged 17, Elizabeth aged 11, Adelaide aged 9, Phillis aged 7, Mary aged 5, Jabez aged 4, Katharine aged 2 and Enoch aged 7 months. In the 1851 census James was a perfumer aged 51 living at 4 High Street. Phillis was aged 47 born in Poplar, Middlesex. Also listed in the house were their daughter Maria aged 27 and born in St George the Martyr in Middlesex. She was described as a visitor at home. Others were daughters, Phillis a dressmaker aged 17 and Mary a milliner aged 16, both born in St Andrews, Middlesex, Katherine aged 11 born and sons, Enoch aged 10, James aged 8 and George aged 4, all born in Thornbury. The 1861 census shows them living at 14 Marlborough Hill, Bristol. James was a bookseller aged 61 and Phillis was aged 57. Of their children, Catherine a tailoress aged 22, Enoch a grocer aged 20 and George a clerk aged 14 were living with them. Phillis died in Bristol area in 1861. James died on 20th January 1867. His address at the time was 21 Paul Street, St Pauls, Bristol. His probate record describes him as a bookseller. Probate was awarded to his son Jabez, a drysalter living at Christmas Street, Bristol. The Browns – the deeds of the property list John Brown and then Jane Brown as occupants of the property. The 1851 census shows John Brown was a printer aged 29 from Bristol. He was living with his wife, Jane who was also 29 and born in Sodbury and their two children: Jane Frances aged 3 and born in Wotton Under Edge and Frederick aged 1 and born in Thornbury. Also visiting them there were Susanna Mansfield, a widowed embroideress aged 49 from Gloucester and a cousin, Thomas Mansfield, an apprentice printer aged 17 from Gloucester. The 1861 census shows John still at the same place. He was now described as a printer and bookseller. Right hand messuage (on south side of ‘Back Lane’ running between The Lion and The old Toll House). The deeds show this property, a house or dwelling house and shop, was purchased by Thomas Osborne Wetmore on 24th and 25th March 1820 from William Ford. Again, we don’t know sufficient to clearly identify which William Ford this was, but we note that there was a William Ford born in 1775 whose parents were a Joseph Ford, possibly the Joseph referred to above, and his wife, Anne. We are not sure who occupied the property in the 1841 Census, possibly Elizabeth Clark or Edwin Knapp, the shoemaker. The 1851 Census shows the property was vacant. On 6th June 1883, the properties were bought by John Weatherhead for £250. By the 1885 Rate Book he had taken over the occupancy of both properties. From this time on, the two properties became one unit. Following Ernest’s death in 1933, the business was sold to William John Beaven of 121 Winchester Road, Brislington draper and outfitter. The Beavens – on 1st March 1934 William John Beaven bought the property for £2900. The 1935 electoral register shows the property occupied by three generations of Beavens: John Henry, the grandfather, William John Beaven, the son and his wife, Florence Annie and their son, Francis Eric Percival Beaven. John Henry born in Trowbridge in 1847, the son of William Beaven, a tailor and his wife, Sarah (nee Edwards). John was brought up living in Trowbridge. In 1874 John married Fanny Louisa Chapman in the Melksham area. Their son, William John Beaven was born in Wellington, Somerset on 6th July 1875. The 1881 census shows John was a drapers assistant at Eastbourne Road, Trowbridge. By 1891 the family had moved to 5 Silver Street, Bradford upon Avon and John had become a draper. The 1901 census shows John Henry and Fanny still at 5 Silver Street, Bradford upon Avon. Their son, William John, was an assistant draper living at 214 High Street, Lewes in Sussex. William John married Florence Annie Levers in 1903 in the Haverfordwest area. Florence had been born in Wadebridge on 25th May 1876. In 1901 she was a milliner living with her parents, Thomas Francis Levers and his wife, Caroline in Barn Street, Haverfordwest. William and Florence’s son, Francis Eric Percival, was born Brislington on 25th September 1904. The 1911 census shows the three generations were living together at 6 Wick Road, Brislington. William John was a milliner and fancy draper. Florence and John Henry were assisting him in the business. John Henry was now a widower as Fanny had died in 1908 in Bristol area. The Beavens moved to Thornbury in 1934 when they bought Commerce House and the drapers business from the descendents of the Weatherhead family. They advertised themselves as ‘Drapers, Outfitters and Complete House Furnishers’. Adverts of the period show that they also sold toys. John Henry died in Thornbury in 1936 aged 89. In 1936 Francis married Phyllis Ruth Pollard in the Bristol area and they settled to share the house and the business at Commerce House. Phyllis was born on 9th March 1912. The special register compiled in 1939 in preparation for the war describes William as a ‘draper’s outfitter, furniture dealer and china merchant’ and Florence as ‘Practises milliner, drapery window dresser and domestic duties’. Francis was described as a ‘Furniture buyer and manager and book keeper’. It was noted that during the War Francis was a special constable. We understand that Francis’s marriage didn’t last and ended with a very public divorce in 1946 involving a dentist called ‘Ellis’. Phyllis re-married in the Bristol area in 1951 – to a man called Ronald G Surman. Francis’s father, William John, died on 10th March 1948 aged 72. Francis carried on with the business living in Commerce House with his mother. On 6th May 1954 Francis leased the property to George Edward Worthington. Francis and Florence moved away from Thornbury and appeared to settle in Florence’s home county. Florence died in St Austell on 5th July 1959. On 7th April 1960 Francis sold his property in Thornbury to George Edward Worthington for £4500. Francis’s address at that time was Mennears Hotel, St Austell. Francis died in St Austell in 1988. Worthingtons – George Edward and May E Worthington moved to Thornbury in 1954 to take over the business of Francis Beaven. The first lease was agreed on 6th May 1954 subject to a sub-tenancy to a dentist surgery using the first floor of Market Hall. George Edward’s address at the time of the agreement was 23 Market Place, Warwick where he was a draper. George had married May Finan in the Manchester area in 1935. Their daughter, Caroline A. was born in North East Cheshire area in 1941. On 7th April 1960 George bought the property of Commerce House including the Market House and Old Toll House for £4500. George carried on trading there although in 1971 he became part of the Keith Pople Group of companies. 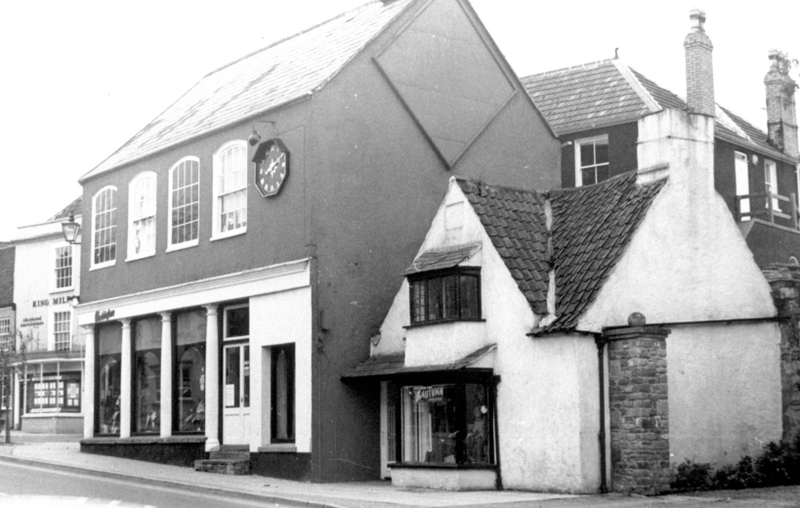 In 1987 the left hand part of the shop was extended backwards onto a plot of land purchased from Lyndon Hawkins of Park House. Wildings – in 1997 the business became part of the Wildings group who can trace their history back to Alfred Wilding, who set up set up a business as hatter and glovier in Newport in 1874. Wildings have their main department store in Newport but also trades under the Rossiters brand in Bath and Cardiff. They offered a range of products for sale in Thornbury, covering ladies fashion, men’s and children’s clothing, toys, homewear and beauty products. In 2017 the buildings were re-developed. The left hand building was retained by Wildings selling a reduced range of goods and the remaining buildings were taken over by the Italian pizza chain, Prezzo.